Analysis: Now fully recovered from a concussion and seemingly the back injury as well, Taylor is on track to dress in Sunday's game against the Ravens. After surrendering the starting gig to Baker Mayfield, Taylor will serve as the top backup option while Drew Stanton drops to the No. 3 role. 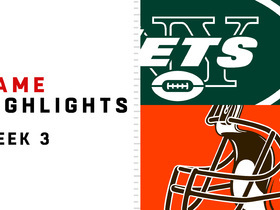 Analysis: Taylor lost his starting job when rookie Baker Mayfield replaced him in Week 3 and came back to win against the Jets. Therefore, if he was healthy, Taylor would've been a backup, but Drew Stanton will take that role instead. Once Taylor's healthy again, he'll surely push Stanton back to the No. 3 spot, but Mayfield would have to lay an egg to be dethroned. Taylor (concussion/back) may not be active for Sunday's game against the Raiders with Drew Stanton expected to serve as the backup to starting quarterback Baker Mayfield, Sam Wyche of NFL Network reports. Taylor (concussion/back) is listed as questionable for Sunday's game against the Raiders, Nate Ulrich of the Akron Beacon Journal reports. 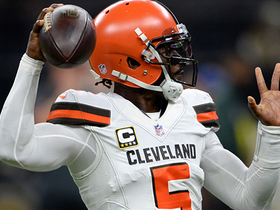 Analysis: The QB is traveling with the Browns to Oakland for the contest, but it remains to be seen if Taylor will be cleared to back up Baker Mayfield on Sunday. If he isn't, Drew Stanton would be in line to handle the assignment. Though Taylor has been cleared from the NFL's concussion protocol, he was limited by a back injury at Thursday's practice, Mary Kay Cabot of The Cleveland Plain Dealer reports. Analysis: As a result, it's not a lock that Taylor will be available to back up Baker Mayfield on Sunday against the Raiders. If he can't go, Drew Stanton would work behind Mayfield in Week 4. Browns head coach Hue Jackson said he would name a No. 2 quarterback Friday before the team's flight to Oakland, according to Cabot. Taylor has cleared the NFL's concussion protocol and will take part in Thursday's practice, Nate Ulrich of the Akron Beacon Journal reports. Analysis: It remains to be seen if Taylor will be eased back into on-field activity with a limited or full practice, but either way, it looks like he's trending toward being available Sunday in Oakland. Head coach Hue Jackson already announced Monday that Taylor would be slated for backup duties behind No. 1 overall pick Baker Mayfield, who gets his first NFL start after coming off the bench to guide the Browns to their first victory in 635 days in Week 3 against the Jets. Taylor (concussion) didn't practice Wednesday, Andrew Gribble of the Browns' official site reports. Analysis: Per head coach Hue Jackson, there's still hope that Taylor will clear the NFL's concussion protocol in advance of Sunday's game against the Raiders. 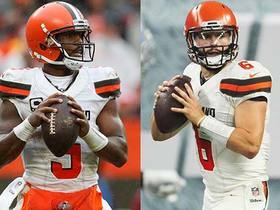 If that doesn't occur, Drew Stanton would be in line to back up rookie Baker Mayfield, whom the Browns officially named as their starting quarterback for Week 4 on Monday. Once he's cleared from his concussion, Taylor will serve as Baker Mayfield's backup. 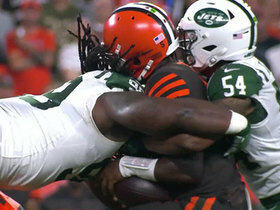 Analysis: Taylor's concussion Week 3 opened the door for Mayfield to step into the fray Thursday night against the Jets. The rookie's sharp performance in the Browns' 21-17 win then left little doubt that he'd draw the start for a Week 4 game against the Raiders. Unless Mayfield falls completely flat, or suffers an injury, Taylor will continue on as veteran QB insurance and as a mentor to the No. 1 overall pick in the 2018 NFL Draft. Taylor (concussion) isn't at practice Monday, Mary Kay Cabot of The Cleveland Plain Dealer reports. Analysis: With Baker Mayfield expected to be named as the Browns' starting quarterback later in the day, Taylor's practice availability shouldn't have much impact on the game plan for Week 4 against Oakland. The Browns will turn to Drew Stanton for the backup job if Taylor isn't cleared from the concussion protocol by Sunday. Taylor is expected to clear the NFL's concussion protocol prior to the Browns' Week 4 game against the Raiders, Adam Schefter of ESPN reports. Taylor is expected to yield the starting quarterback job to Baker Mayfield, Mary Kay Cabot of The Cleveland Plain Dealer reports. Taylor has been ruled out of Thursday's contest with a concussion, Mary Kay Cabot of Cleveland.com reports. Analysis: Taylor took a shot late in the second quarter and was sent to the locker room to be evaluated. His absence will clear the way for 2018 top overall pick Baker Mayfield to lead the Browns against the Jets defense. Mayfield completed three of four passes for 47 yards in his lone drive before halftime. It is unclear at this point who will retain the starting quarterback job going forward once Taylor is cleared for action. Taylor headed into the locker room just before halftime in Thursday's game against the Jets and is being evaluated for a concussion, Mary Kay Cabot of Cleveland.com reports. Analysis: Taylor hit his head hard on a hit in the second quarter and appeared to be jarred. 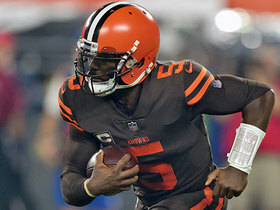 After a brief evaluation in the tent, the veteran quarterback headed to the locker room, opening the door for rookie Baker Mayfield to take over the Browns offense. Taylor took three sacks and was 4 for 14 for 19 yards before exiting Thursday's contest, so there is no guarantee he will reclaim the starting quarterback job once cleared for return. Taylor completed 22 of 30 passes for 246 yards with a touchdown and an interception during Sunday's 21-18 loss to the Saints. He also accounted for 26 yards on the ground. Taylor completed 15 of 39 passes for 197 yards with a touchdown and an interception during Sunday's 21-21 tie with the Steelers. He also rushed for a team-high 77 yards and a score on eight carries. Taylor isn't listed on Cleveland's initial injury report ahead of Sunday's opener against Pittsburgh, Scott Petrak of the Elyria Chronicle-Telegram reports. Taylor (wrist/finger) won't play in Thursday's preseason finale against the Lions, Mary Kay Cabot of The Cleveland Plain Dealer reports. Analysis: Taylor suffered a bruised wrist and a dislocated pinkie in preseason action this past Thursday, but the plan to rest him in the team's preseason finale is due to coach Hue Jackson's decision to rest his starters, as opposed to any significant injury concerns. As a result, Baker Mayfield will draw the start this week before returning to backup duties behind Taylor when the Browns open their regular-season slate against the Steelers on Sept. 9. Taylor practiced Saturday with his left hand wrapped, Scott Petrak of the Elyria Chronicle-Telegram reports. Analysis: In the aftermath of Thursday's preseason win against the Eagles, Taylor was diagnosed with a sore wrist and dislocated pinky finger in his left hand, the result of an awkward fall. He was steadfast in his belief that he wouldn't miss practice, which came to pass Saturday. Due to the state of the hand, Taylor will almost certainly have limitations on his workload but doesn't appear as if he'll miss any regular-season games. Taylor (wrist, finger) isn't expected to miss any practice time, Scott Petrak of the Elyria Chronicle-Telegram reports. Analysis: Though his injury initially looked serious, Taylor seems to have escaped Thursday's preseason game with nothing more than a sore wrist and a dislocated pinky finger on his non-throwing hand. Coach Hue Jackson expects his starting quarterback to participate when the team resumes practicing this weekend. No. 1 overall pick Baker Mayfield will need to wait at least a little bit longer for his shot at the starting job. Taylor, who is dealing with a sore left wrist, also suffered a dislocated pinky during Thursday night's preseason game against the Eagles, the Cleveland Plain Dealer reports. Analysis: Initial X-rays on the QB's hand/wrist area came up negative, but Taylor still has further exams on tap. For now, the Browns expect Taylor to be okay after Thursday's injury scare, a notion supported by the fact that signal-caller re-entered the contest. Coach Hue Jackson said he is "comfortable and confident" Taylor (hand) will be okay, Nate Ulrich of the Akron Beacon Journal reports. "Anytime your quarterback gets nicked like that, you're always concerned," Jackson said. "But I think the fact that he was able to go back in the game, that was a good sign. I feel comfortable and confident that he's going to be OK and that we'll have him." X-rays on Taylor's left hand came back negative, but he will be sent for further testing Friday, Tom Withers of the Associated Press reports. Analysis: That Taylor was able to re-enter Thursday's game after having his wrist bent back at the end of a scramble is encouraging, but the Browns will do their due diligence and send their starter in for further testing. Once those test results come back, Taylor's availability for Week 1 will come into focus. He's unlikely to play in the final week of the preseason even if he's healthy enough to do so. Taylor (hand) completed 11 of 16 passes for 65 yards and added five yards on the ground during Thursday's 5-0 victory over the Eagles. Analysis: Taylor exited the game briefly after hurting his non-throwing hand, but showed some toughness in returning. He completed seven of eight passes after his return, but big plays were hard to come by. After a brief preseason-opening appearance during which he posted a perfect passer rating, Taylor has completed 65.2 percent of his passes over the past two weeks, but has averaged just 3.8 yards per attempt. Taylor (hand) has returned to Thursday's preseason contest against the Eagles. Taylor is questionable to return to Thursday's game against the Eagles with a left hand injury. Analysis: Taylor's injury looked fairly gruesome on first appearance, so it would be surprising to see him return to a preseason contest. More information about Taylor's hand will continue to emerge, but in the meantime Baker Mayfield looks primed to take over the Browns first team offense. Taylor landed awkwardly on his left wrist during Thursday's preseason game against the Eagles, Pat McManamon of ESPN.com reports. Analysis: Taylor was rolling to his left, and after unloading a pass intended for Jarvis Landry, came down hard on his left wrist. His lower arm then bent awkwardly and he immediately retreated to the sideline. More information on the injury will surface in the near future, but it certainly did not look good at first glance. If Taylor is forced to miss time, 2018 No. 1 overall pick Baker Mayfield figures to lead the Browns offense moving forward. Coach Hue Jackson said Taylor and the other starters will play approximately half of Thursday's preseason game against Philadelphia, Nate Ulrich of the Akron Beacon Journal reports. Analysis: Jackson doesn't plan to leave his starters in after halftime but didn't entirely rule out the possibility. Taylor completed nine of 12 passes for 121 yards and a touchdown over the first two weeks of the preseason, adding two carries for seven yards. He's done nothing to lose his job as the Week 1 starter. Taylor completed four of seven pass attempts for 22 yards and ran once for five times in Friday's 19-17 preseason loss to the Bills. Browns head coach Hue Jackson said Taylor will play more than two drives in Friday's preseason game against the Bills, Mary Kay Cabot of The Cleveland Plain Dealer reports. Analysis: Taylor was sharp on two drives in last week's preseason opener against the Giants, completing all five of his pass attempts for 99 yards and a touchdown. Baker Mayfield then handled the vast majority of playing time under center after the first quarter, throwing for 212 yards and a pair of scores. While Mayfield's professional debut was impressive, Jackson has been adamant that Taylor will be the team's Week 1 starter. Coach Hue Jackson reiterated Wednesday that Taylor is considered the Browns' starting quarterback, Andrew Gribble of the team's official site reports. 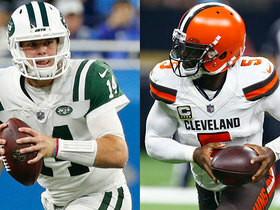 Referencing Taylor, who the Browns recently acquired in a trade with the Bills, coach Hue Jackson confirmed that the 28-year-old is "going to be the starting quarterback (in 2018). There is no competition," Ian Rapoport of NFL Network reports. Taylor will be traded to the Browns in exchange for a third-round draft pick going to the Bills, Ian Rapoport of NFL Network reports. General manager Brandon Beane reiterated this week that the team has no plans to cut Taylor before he's due a roster bonus March 16, Chris Brown of the Bills' official site reports. "Tyrod is on our roster right now and that's the plan," said Beane. "We're just taking it day by day. We're trying to get better everywhere, so we're looking at every position including quarterback, but Tyrod did a lot of good things for us. So I'm not really worried about the (roster) bonus. I see him on our roster right now. Unless something changes he'll be here through that part." The Bills aren't planning on cutting Taylor (concussion) during the offseason, Ian Rapoport of NFL Network reports. Taylor (concussion) said he would like to remain the quarterback of the Bills, but he will not accept another pay cut to do so. "Nah, that's not really part of the plan right now," Taylor told The Buffalo News on Friday. "Definitely not part of my mindset. I've done that before (last year, when he accepted a $10-million salary reduction over two seasons). I don't think there's a need to do that again. That's definitely not part of my mindset." Taylor (concussion) was able to walk off the field to the locker room under his own power after being knocked to the ground hard late in Sunday's 10-3 AFC wild-card loss to the Jaguars. Analysis: Taylor, who is now in the NFL's concussion protocol, was replaced in the game by Nathan Peterman. Prior to his exit, Taylor had completed 17 of 37 passes for 134 yards, while adding seven carries for 27 yards. Taylor completed 19 of 27 passes for 204 yards with one touchdown and no interceptions in Sunday's 22-16 win over the Dolphins. He also rushed six times for 35 yards. Taylor completed 21 of 38 passes for 281 yards while rushing three times for 16 yards without a touchdown or turnover in Sunday's 37-16 loss to New England. Taylor (knee) completed 17 of 29 passes for 224 yards and a touchdown during Sunday's 24-16 win over Miami. He added 42 yards and a touchdown on six carries. Bills head coach Sean McDermott relayed Friday that Taylor (knee) will start at quarterback Sunday against the Dolphins, Chris Brown of the Bills' official site reports. Taylor (knee) practiced again Thursday but coach Sean McDermott would not commit to him as a starter for Sunday's game against the Dolphins, Mike Rodak of ESPN.com reports. "We're working that direction. We just got to see. Obviously he's worked more this week than last week, so that's a step in the right direction," said McDermott. "I want to come out tomorrow and see how he does tomorrow." Analysis: Fellow quarterback Nathan Peterman remains in concussion protocol and practiced again Thursday around the restrictions that get placed in such situations. The thinking is Taylor will be the guy this week, since McDermott has said all along he's the starter once fully ready to play, but owners should certainly wait for official confirmation following Friday's practice or ahead of Sunday's 1pm ET start time. Taylor (knee) was a full participant in practice Wednesday. Bills head coach Sean McDermott said Taylor (knee) will take part in most of the team's drills during Wednesday's practice and will start Sunday against the Dolphins if healthy. Taylor (knee) said he will definitely return for Sunday's game against the Dolphins, while Bills head coach Sean McDermott said it's too early to make a declaration, Mike Rodak of ESPN.com reports. Analysis: While player and coach aren't quite in agreement, McDermott did say Taylor will be the starter whenever he's healthy enough to play. The Bills may be inclined to let Taylor play even if he isn't quite back to 100 percent, as backup quarterback Nathan Peterman had to be removed from Sunday's 13-7 win over the Colts after suffering a concussion. In the unlikely event neither Taylor nor Peterman is available, Joe Webb would get the start against Miami in Week 15. Bills head coach Sean McDermott reiterated Monday that Taylor (knee) will still be the starting quarterback if he's healthy, Mike Rodak of ESPN.com reports. Taylor (knee) is inactive for Sunday's game against the Colts. 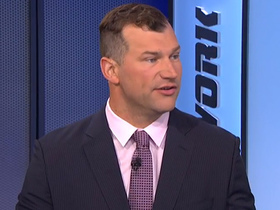 Analysis: As a result, Nathan Peterman will draw the start at QB for the Bills in Week 14, while Taylor will look for his knee to improve to the point that he's healthy enough to be in the mix for the assignment next weekend against the Dolphins. Nathan Peterman is expected to start Sunday against the Colts in place of Taylor (knee), per a source, Adam Schefter of ESPN reports. Analysis: Taylor hasn't been officially ruled out of Sunday's game, but it looks like he won't start even though he practiced on a limited basis Friday and is listed as questionable on the official injury report. Taylor (knee) is listed as questionable for Sunday's game against the Colts. Analysis: The final injury report was a mere formality, as head coach Sean McDermott already said Taylor would practice on a limited basis Friday and ultimately be a game-time decision ahead of Sunday's 1:00 p.m. start. Despite the highly favorable matchup, it will be tough to have faith in Taylor if he ends up playing, given that his mobility (which accounts for much of his value) almost certainly would be restricted. Rookie fifth-round pick Nathan Peterman will get the start if Taylor doesn't play. Bills head coach Sean McDermott said Taylor (knee) will be limited at practice Friday and will be a game-time decision for Sunday's matchup with the Colts. Taylor (knee) was limited to individual drills at practice Thursday, Mike Rodak of ESPN.com reports. 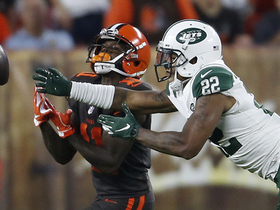 Analysis: Taylor's return to practice -- albeit in a limited fashion -- is a step in the right direction, but he's still managing his injury, with Jay Skurski of The Buffalo News relaying that Taylor sported a protective sleeve on his injured left knee Thursday. In the event that Taylor gains clearance to play Week 14 against the Colts, he'll draw a favorable matchup against the 3-9 Colts, who have allowed an NFL-worst 271.6 passing yards per game this season. Taylor (knee) was present for the start of the Bills' practice Thursday, Sal Capaccio of WGR Sports Radio 550 reports. Analysis: The Bills will provide an update on the extent of Taylor's participation in practice after the session concludes, but his presence Thursday is nonetheless a positive sign after the quarterback was held out of Wednesday's practice. If Taylor is able to put in a limited practice or two this week without any major setbacks to his bruised left knee, he'll have a good shot at suiting up Sunday against the Colts. Taylor (knee) won't participate in practice Wednesday, Chris Brown of the Bills' official site reports. Bills head coach Sean McDermott said Monday that Taylor will remain the team's starting quarterback if he's healthy enough to play, adding that Taylor is day-to-day with a patella tendon contusion in his left knee, Jay Skurski of The Buffalo News reports. Taylor (knee) told people close to him that he believes he avoided a major injury, Ian Rapoport of NFL Network reports. Taylor was forced out of Sunday's game against the Patriots with a knee injury. Analysis: With Taylor sidelined for the remainder of Sunday's contest after being carted off the field in the fourth quarter, Nathan Peterman is in at QB for the Bills. Prior to his exit, Taylor had completed nine of 18 passes for 65 yards and a pick and ran three times for 32 yards. Taylor will start Week 13 against the Patriots, The Buffalo News reports. Taylor completed 19 of 29 passes for 183 yards and a touchdown while rushing nine times for 27 yards in Sunday's 16-10 win over Kansas City. Bills head coach Sean McDermott named Taylor the team's starting quarterback for Sunday's game against the Chiefs. 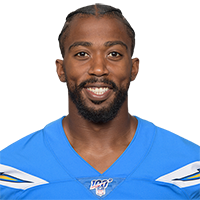 Bills coach Sean McDermott declined to commit to Taylor as the Week 12 starter when speaking to the media after Sunday's 54-24 loss to the Chargers, ESPN.com's Mike Rodak reports. Bills head coach Sean McDermott announced Wednesday that Nathan Peterman would replace Taylor as the team's starting quarterback for Sunday's game against the Chargers. Although Taylor struggled in Sunday's drubbing at the hands of the Saints, coach Sean McDermott insisted Taylor will remain the starting quarterback, Chris Brown of the Bills' official site reports. "Because I believe in Tyrod," said McDermott. "Tyrod is our starter. That's what I said (Sunday). I know what Tyrod has done and I also know what Nate has done. Tyrod is our starter." Taylor completed nine of 18 pass attempts for 56 yards and an interception Sunday against the Saints. He also gained 27 yards on three carries in the 47-10 loss. 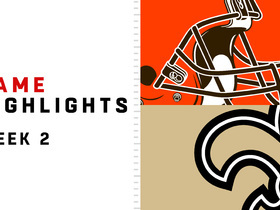 Analysis: Taylor endured perhaps the roughest outing of his career in this one, managing a miserable 3.1 yards per attempt while posting the lowest yardage total of his career as a starter. He finished as the team's second-leading rusher on the day, but even that wasn't enough to amount to anything noteworthy from a fantasy perspective. Taylor came into Sunday on the back of three consecutive productive outings and will look to bounce back next week against the Chargers. Taylor completed 29 of 40 passes for 285 yards with two touchdowns and no interceptions in Thursday's 34-21 loss to the Jets. He also rushed six times for 35 yards and a touchdown and fumbled twice, losing one. Taylor will have to wait until Week 10 before throwing to newcomer Kelvin Benjamin, who is inactive for Thursday night's game against the Jets.